What was the Apollo-Soyuz mission and why was it famous? After the final Apollo flight to the Moon, the next spacecraft, Apollo 18, was used for another historic event. On July 15, 1975, the Soviet Union’s Soyuz 19 spacecraft was launched with cosmonauts Alexei Leonov (1934–) and Valeriy Kubasov (1935–) onboard. Seven hours later, Apollo 18 took off, carrying astronauts Thomas Stafford (1930–), Vance D. Brand (1931–), and Donald “Deke” Slayton (1924–1993), as well as a special docking module designed to fit Soyuz at one end and Apollo at the other, with an airlock chamber in between. That evening, the two spacecraft successfully rendezvoused with one another and docked together. The Americans entered Soyuz and the two crews shook hands on live television. The two spacecraft remained docked for two days, during which time they carried out joint astronomical experiments. After separating, Soyuz 19 returned to Earth, while Apollo 18 stayed in orbit for three more days. Both vessels landed safely. Many people consider the Apollo-Soyuz Test Project—the first joint venture in space between the United States and the Soviet Union—the beginning of the end of the hostile “space race” that started in the 1950s, and the start of the modern era of international cooperative human activity in space. 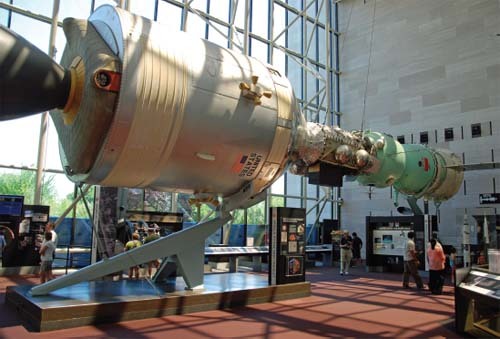 A mock-up of the Apollo and Soyuz capsules docking in space can be seen at the National Air and Space Museum in Washington, D.C.